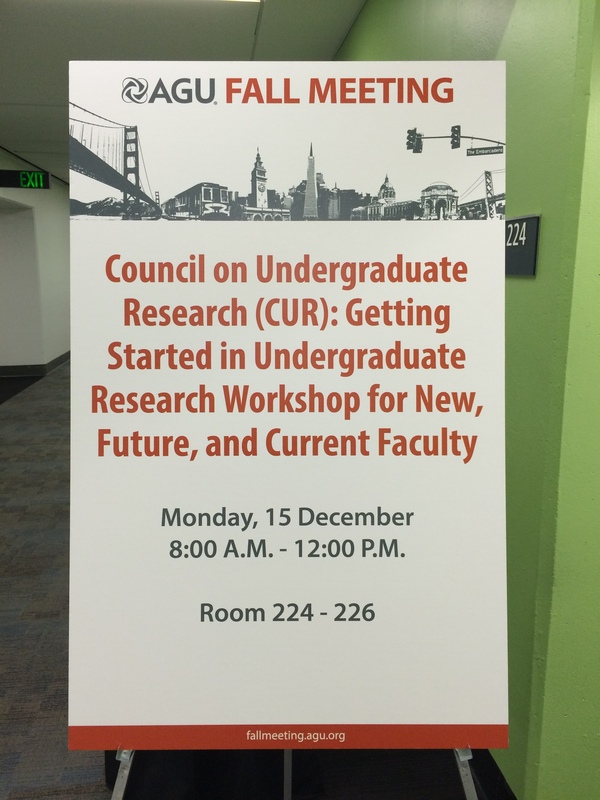 Today was the first official day of the 2014 AGU Fall Meeting, and it was quite a full day! My morning was spent assisting with a workshop run by the Geoscience Division of the Council on Undergraduate Research (CUR), titled “Getting Started in Undergraduate Research Workshop for New, Future, and Current Faculty.” As you can see from the workshop description, this four-hour workshop covered a wide range of topics to help current and future faculty members learn about strategies for mentoring undergraduate student researchers. I presented on doing undergraduate research with students as freshmen and sophomores (that’s you, Penn State Brandywine students!). Other presenters focused on building research experiences into courses, using research instrumentation in courses, mentoring independent research projects, and funding opportunities for undergraduate research. I actually stayed in the same room to present in a lunchtime session on “Undergraduate Research with Students at Two-Year Colleges,” where several examples and models were shared of student research from the field to collaborating with government agencies. I then connected with my undergraduate researcher Kimmie Bowen and we went through some of the posters in the Poster Hall together. We spent some time looking at posters in the session Connecting Geoscience with the Arts, and then headed over to the talks on the same topic. I’ve been exploring the field of science communication over the past year-and-a-half, so I was very curious to learn specifically about using art as a way to showcase and engage people with the Earth sciences. This session did not disappoint! The session really emphasized that art can serve as a creative force in STEM education, that engaging people in science through art will allow them to see unexpected connections between their lives and science. I made pages of notes from the seven talks, reminding myself to further explore the apps for Painting with Time and Painting with Time: Climate Change. I really enjoyed hearing about the COOL SCIENCE program, where a contest is held for kids in grades K-12 submit artwork to engage riders on mass transit in Massachusetts, and creative products created by artists while participating in oceanographic research cruises through a program called Art & Science: Envisioning Ocean Depths. There were also audio works of art, where the Polar Seeds and University of Minnesota shared their creative works. See this video below that describes the Univ. of Minnesota work of a cello performing climate data (I feel so fortunate to have seen this student perform his work at ScienceOnline Climate last year!). 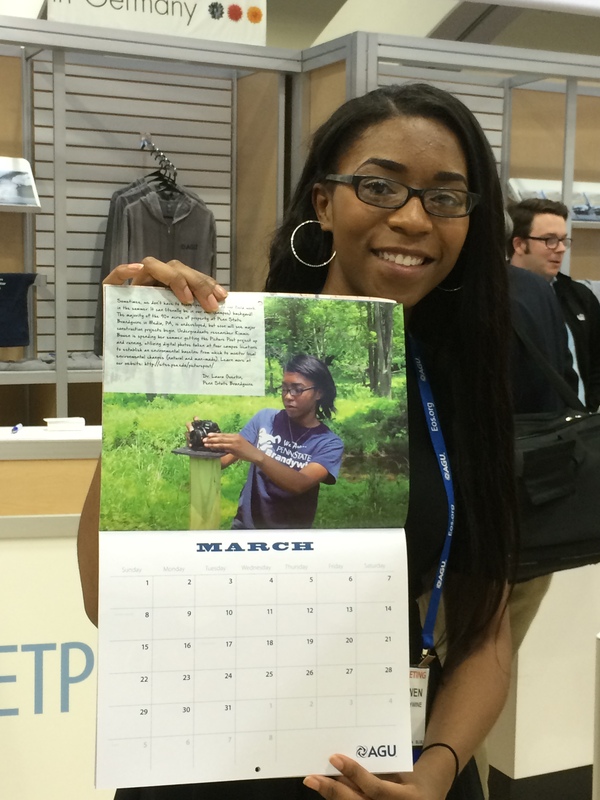 I then headed over to the AGU Exhibit Hall with Kimmie to swing by the AGU booth to pick up a copy of the 2015 AGU Field Postcards calendar – with Kimmie featured during the month of March! I’m so thrilled for and proud of Kimmie and all of her efforts and successes with her Picture Post project. But the thick swarm of people in the Exhibit Hall proved to be too much for both of us, so she went off to the Student Mixer while I went over early to grab us some seats for the evening movie premiere. 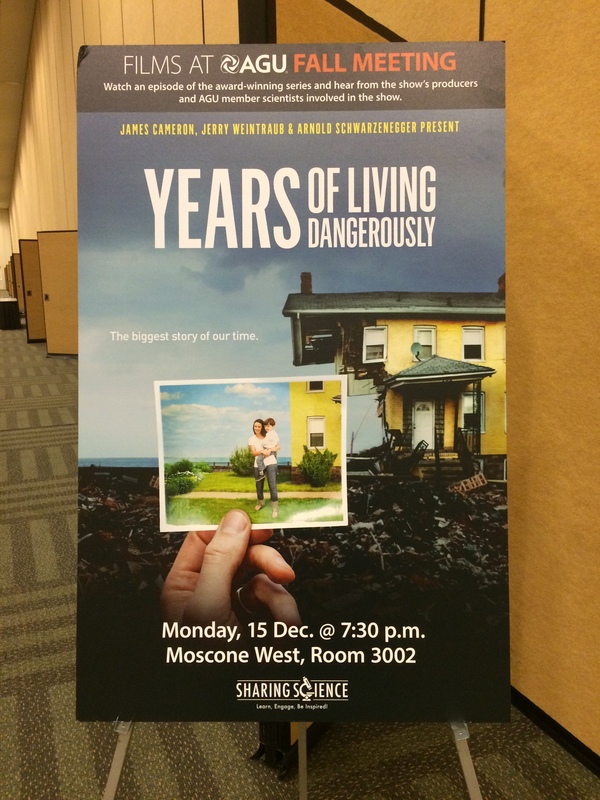 The AGU Monday night movie was a viewing and panel discussion about the Rising Tide episode from the Showtime series Years of Living Dangerously. The movie and discussion were amazing in looking at climate change, the human influence, the impact of Hurricane Sandy on Staten Island, and the politics and consequences of being on the “wrong side” of climate science as a Congressman. I was, however, greatly disappointed to learn that this Emmy-award winning series is only on Showtime, and that this is really the only series that exists dedicated to exploring issues relating to climate change. There is one full episode online on their YouTube Channel, but I’m hoping this past and future seasons of the series become more widely accessible – it is the only way to reach the widest audience to make a difference!